Kosher Crops in Glatt Express in Teaneck, N.J. Credit: Israel Ellen. 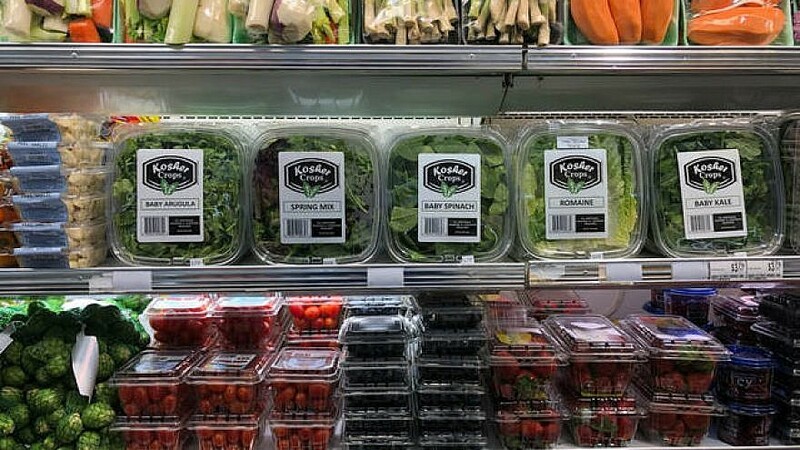 While an array of triple-washed or greenhouse-grown salads has become available in kosher stores locally over the past several years, they have generally been limited to very basic lettuce blends and have varied in quality. (February 6, 2019 / JNS) While leafy greens contain essential vitamins, minerals and dietary fiber, they are particularly susceptible to infestation. Unwashed greens commonly house tiny insects such as aphids, thrips, leafminers and cabbage worms. 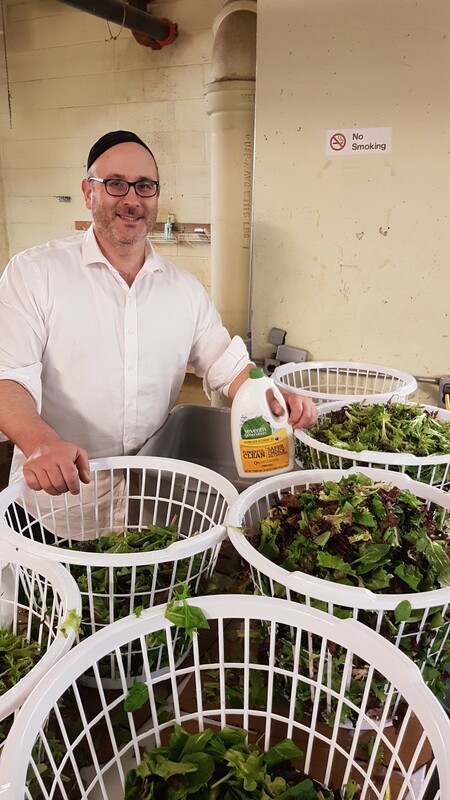 Checking salad greens for these charming creepy crawlies takes a lot of time for many kosher-keepers, and still others might decide to skip the salad altogether, deciding that intensive washing and checking simply isn’t worth the effort. Israel Ellen with the crops. Credit: Israel Ellen. 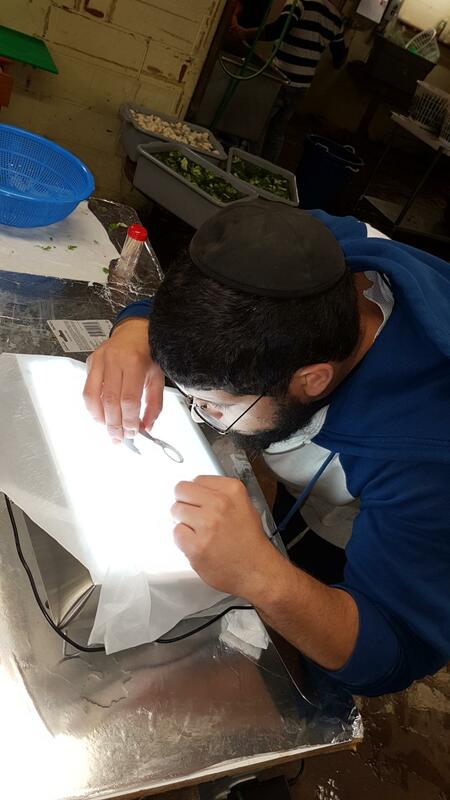 A “mashgiach” (kosher supervisor) checks lettuce with the Star-K method of using a light with a “thrip cloth.” Credit: Israel Ellen. After securing the Star-K, Ellen headed to Teaneck and Passaic, N.J., to pitch his products. Kosher Crops products are now available in every kosher grocery store, including Seasons, Glatt Express and Cedar Market. “We’re now selling just under 1,000 boxes a week. Each five- to seven-ounce box of produce costs $5.99 to $6.99, and has a shelf life of seven days. 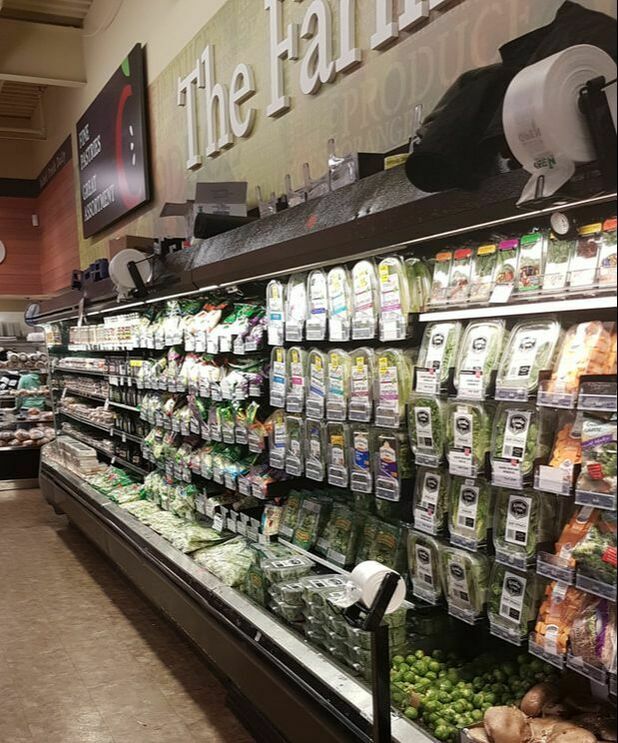 “We hope to launch in stores in Baltimore and service more ShopRite stores in New Jersey. We’re also in talks to get other hechsherimso we can sell in New York City; Monsey, N.Y.; and the Williamsburg” neighborhood of Brooklyn, N.Y.
Kosher Crops in Cedar Market. Credit: Israel Ellen.